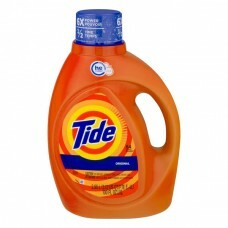 Tide® Original Laundry Detergent. 6X power. 1/2 times*. HE turbo clean. 64 loads. 2.95 L ( 3.12 US qt) 100 fl oz liq. *1 dose of Tide HE Turbo Clean in quick cycle vs. 6 doses of the next leading liquid HE. Pre-treat tough stains with Tide. Contains 64 loads as measured to bar 1 on cap. Bottle made from 25% or more post-consumer recycled plastic. Contains no phosphate. Questions? 1-800-879-8433. Visit www.tide.com. ©2014 P&G. Follow care label instructions, then sort. Test inside seam for colorfastness. Add detergent, then add clothes.